The tanks are poised for action. Their commanders confer one final time. 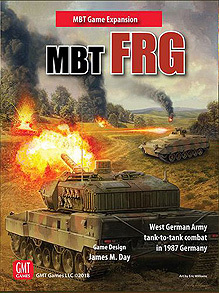 IMPORTANT NOTE: In order to play this Expansion, you will need a copy of the basic MBT game. FRG expands the NATO forces focusing on the West German Army of 1987. Included are the Leopard 1 (two models), Leopard 2 (two models, Marder, Jaguar 1 (HOT ATGM) and Jaguar 2 (TOW ATGM), Luchs, Gepard, PAH-1A1 attack helicopter, Tornado IDS aircraft, and a number of other units including infantry and their various anti-tank weapons. The new mapboards include unique terrain features including a large urban area, airfield, and a supply depot. The playbook outlines the Table of Organization and Equipment (TO&E) for the West German mechanized forces of the period. The 10 scenarios showcase the German Army and cover the range of action between NORTHAG (Northern Army Group) and CENTAG (Central Army Group) German forces and Soviet GSFG (Group of Soviet Forces Germany) and Soviet CGF (Central Group Forces) forces.